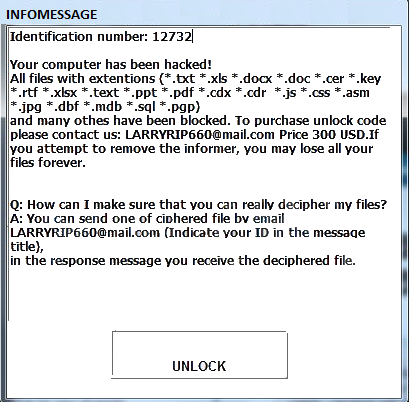 Fedex Crypt Virus is the infection that blocks PC, encrypts user’s data and asks him to pay a sum of money ($300) in order to unblock the computer and to decrypt the user’s information. If you see the alert message that includes such information, then you can be sure that you have Fedex Crypt Virus. The most unpleasant thing about it that you really cannot use you Pc until this infection exists in the system. You also can not use Safe Mode in order to remove Fedex Crypt Virus because the infection blocks it too. Of course to pay money to the virus is not the way out in this situation, you should not pay them because that infection will remove itself and decrypt your information. In this article I will describe the effective method that will help you to uninstall Fedex Crypt Virus. The first thing that you should do when you see this infection on your computer is to should calm down. Only then you can follow the instruction from this page. You should be ready that it is not a simple virus that can be removed without any consequences. But still you should try. So, follow the items of the instruction and remove Fedex Crypt Virus from your computer. Restore the system. For that you should click Start, then in the search box type System Restore and click it when it will be found. Then you should choose the date when the infection was not on your PC and select it. After that you should follow the instructions of the Wizard and so the system will be restored. For that you should open Registry Editor: press Windows+R buttons, then type regedit in the opened line and press Enter. Then you should use CTRL+F buttons in order to use the search in the Registry. Find the enumerated registry values and remove them. But you should know that there is no removal method will decrypt the information on your computer, neither manual, nor automatic. But I can advise you to try to use the decryptors that probably will help you to save your information: RannohDecryptor or RectorDecryptor. So, after Fedex Crypt Virus removal you can use these programs in order to return the data to the previous normal state.